A high school senior accepted to college in the fall. A child of a St. Joseph parishioner, a child of a St. John Neumann parishioner or a child of a St. Joseph Council Knights of Columbus member who is a parishioner elsewhere). A Practicing Catholic - i.e., the applicant must attend mass and the sacraments regularly. 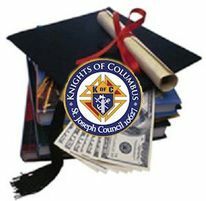 To apply for a scholarship, the applicant must use the Joseph F. Labuta Scholarship Application form. b) How the applicant plans to continue to practice his or her faith in college. In addition, the applicant must provide a copy of his/her junior year final report card or most recent report from his/her school showing class rank & GPA and any advanced placement coursework. 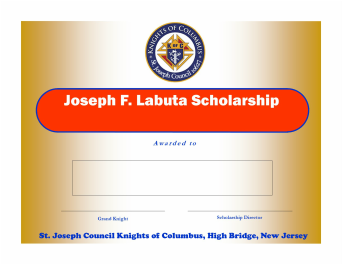 The Joseph F. Labuta Scholarship Application Form can be downloaded as a PDF by clicking the "Download File" link at right. The PDF is "Interactive," allowing an applicant to complete all entries at his/her computer with Adobe Reader software or the Windows "Reader" App. It can then be printed for submission. The PDF can also be printed and filled out manually.